Jered Weaver came into the league as a highly touted prospect. 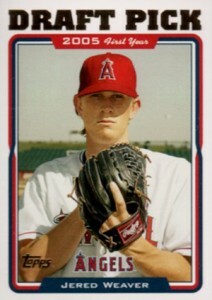 Drafted with the 12th pick in 2004, Weaver started 19 games for the Angels just a couple of years later. It took him a couple of years to become the dominant pitcher many expected but he has finally arrived. Although prices are starting to rise, collectors should start taking note of Jered Weaver rookie cards before they really take off. 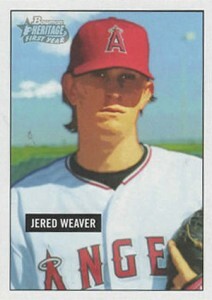 Jered Weaver has six different rookie cards, all from 2005 Topps products. Oddly, between the six cards, there are only three different photos. The pitcher has just one autographed rookie, which is found in 2005 Bowman Chrome Baseball. Weaver also has cards dating back to 2003. However, as national team cards, they're not considered true rookies. That said, they are a great place to find some early autographs from the ace. 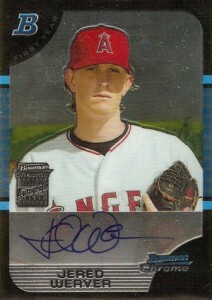 The 2005 Bowman Chrome Jered Weaver autograph is the pitcher's top rookie. The contest isn't even close. For those who can afford it, this will likely always be the go-to card. It's the only autographed Jered Weaver rookie card. It has additional clout coming from the Bowman Chrome brand. As always, serial-numbered Refractor parallels are also very popular with collectors. The 2005 Bowman Chrome Jered Weaver autograph rookie has already started to take off. Raw copies were selling for about $60 at the time of the 2012 All-Star Game. Over the next month or so, the card rose to about $80. This is still a lot lower than a lot of other Bowman Chrome autograph rookies. While not quite the investment as in the past, the card still has room to grow. Does the picture look familiar? Jered Weaver's 2005 Bowman Heritage rookie card uses the same photo as the one used on both his Bowman Chrome and Bowman Sterling rookies. The vintage-style card is inspired by the classic 1951 Bowman Baseball design. Bowman Heritage is very under appreciated. Although not rare, the cards aren't mass produced either. As far as low-end Jered Weaver rookie bargains go, this is a great pick. Is it just me or does this card bring back memories of the opening credits for Gilligan's Island? 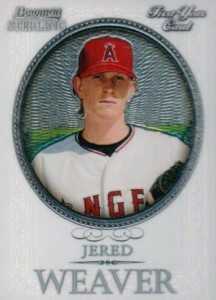 Outside of the 2005 Bowman Chrome Jered Weaver, his 2005 Bowman Sterling is his most valuable rookie card. Hailing from a high-end product and available in relatively limited numbers, it's not the easiest card to find. Multiple Refractors add to the chase. 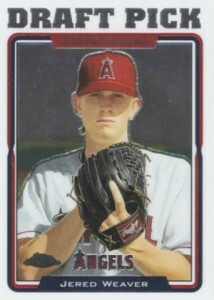 The 2005 Bowman's Best Jered Weaver is the only one of his rookies to feature a unique photo. It also has the busiest design. It comes from a largely forgotten set that got lost in the Bowman Chrome shuffle. For those looking for something more high-end but for cheap, this is a good choice, although the look is somewhat dated. Even though they're not high-end by today's standards, there's always something iconic about a flagship Topps rookie card. 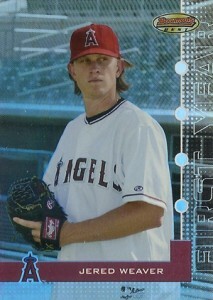 Jered Weaver's comes from 2005 Topps Updates and Highlights. It's a low-end card that can be picked up very cheap, even with Weaver emerging as one of the game's best pitchers. 2005 Topps Chrome Updates and Highlights was the first time since 2001 that the late-season Topps and Topps Chrome sets were packaged separately. One of the more popular Jered Weaver rookies, Refractor parallels add to the chase. Had Weaver been one of the autograph signers for the set, this card could have challenged the Bowman Chrome rookie.